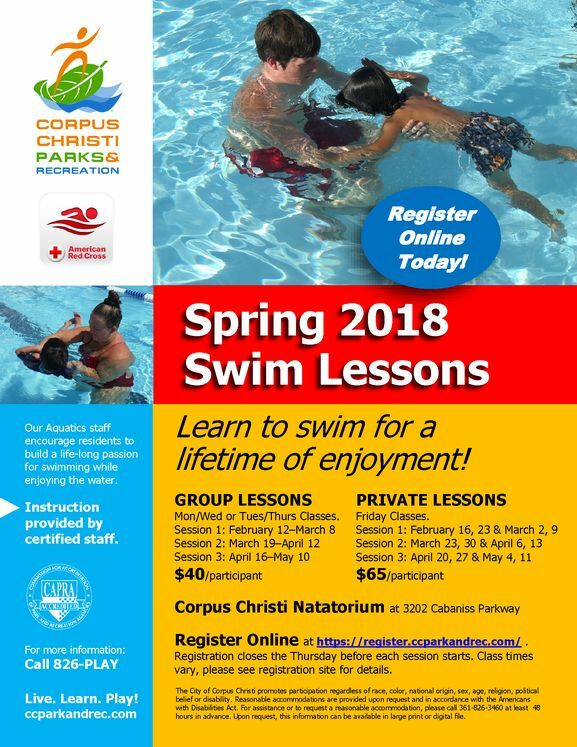 CORPUS CHRISTI, TX – With the opening of the newly renovated Corpus Christi Natatorium, the Corpus Christi Parks & Recreation Department will renew its year-round Group and Private Swim Lessons beginning February 12th. The pool is located at 3202 Cabaniss Parkway. Ready to learn how to swim? The spring 2018 swim lesson season will run from February 12 to May 10. Our swim instructors are dedicated to teaching the skills needed to stay safe in the water which is the first step in enjoying swimming in a pool or the ocean. Swim lessons are designed to allow students of all ages and abilities to progress from basic to advanced swim strokes as they learn and practice new skills in the pool. Group Swim Lesson sessions are offered monthly. Each four-week session consists of two classes per week. All classes are 30 minutes long and are offered on Monday/Wednesday or Tuesday/Thursday evenings. Group swimming lessons are designed for children 3-12 years of age. Teen/Adult, as well as Parent & Toddler classes, are available. Level placement is based on the student’s swimming ability, age, and date registered. Swimmers ‘graduate’ to more advanced levels once they are competent in all the skills covered in the previous level. REGISTRATION: The fee is $40/swimmer for each 4-week session of group lessons (8 classes). Private lessons are also available on Friday evenings for $65/swimmer for each 4-week session (4 classes). For the complete schedule, requirements and to register online, visit www.ccparkandrec.com (click ‘Swim Programs & Pools’). Online registration opens on Saturday, January 13, 2018 for Session 1. For more information, call 361-826-PLAY. Look for the upcoming grand opening of the Corpus Christi Natatorium by the Corpus Christi Independent School District coming soon.